You must have the harness off of the donor LT1, TPI, LS1 engine, undamaged. We re-configure and tail out what needs to be used, to run the engine and transmission correctly, at full power . This is a very complete service we offer, the wire harness also will look new. Our customers use this service to deploy a new modern fuel injected power plant in sand rails, kit cars, off road race rigs, street rods and 4×4 trucks. You can place the modified wire harness anywhere space and location permits. If you have a required length or drawn up measurements for a specific engine, that we produce a wire harness for, email us we will let you know what the cost. 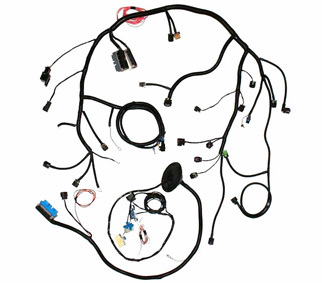 The above wire harness is the I6 4.2 engine from GM. Contact us to order a modified harness.